Hollenberg Pony Express Station, also known as Cottonwood Pony Express Station, is now located on Hollenberg Ranch State Park. Built by Gerat H. Hollenberg in 1858, this cabin was associated with the Oregon and California Trails, the Pony Express, and the Butterfield Overland Mail. Hollenberg traded with emigrants on the trails, operated the westernmost Pony Express station in Kansas, and provided relay services for the Overland Mail. The Kansas Cosmosphere and Space Center is a museum and educational facility in Hutchinson, Kansas that is best known for the display and restoration of space artifacts and educational camps. It is one of only three museums to display flown craft from Mercury, Gemini and Apollo missions. The Kansas Underground Salt Museum is built within one of the world’s largest deposits of rock salt. It provides the opportunity to go 650 feet (198 meters) beneath the Earth’s surface. It is a unique destination attraction for exploring an amazing environs carved from salt deposits formed 275 million years ago. The museum is located in the Hutchinson Salt Company mine which began operation in 1923 as Carey Salt Company. Tallgrass Prairie National Preserve is a United States National Preserve located in the Flint Hills region of Kansas, north of Strong City. 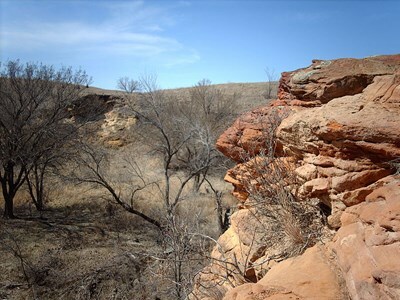 The preserve protects a nationally significant example of the once vast tallgrass prairie ecosystem. Of the 400,000 square miles (1,000,000 km²) of tallgrass prairie that once covered the North American continent, less than 4% remains, primarily in the Flint Hills. Tallgrass Prairie National Preserve is a new kind of national park. The Eisenhower Presidential Center, officially known as the Dwight D. Eisenhower Presidential Library and Museum or Eisenhower Presidential Library and Museum, includes the Eisenhower presidential library, President Dwight David Eisenhower's boyhood home, Museum, and gravesite. The center is located in Abilene, Kansas, home of President Eisenhower. Admission to the Visitor Center, boyhood home, Place of Meditation (gravesite), and the archives is free. Admission to the museum is $8 for adults. The Kansas State Capitol is the state capitol building of the U.S. state of Kansas. Housing the Kansas Legislature, it is located in the state capital of Topeka. A large mural in the east wing, painted by Kansan John Steuart Curry, centers on an image of abolitionist John Brown. This is believed to be the only instance of a person convicted of treason being featured in a state capitol. Dome tours are held daily on the half-hour. The Wichita Art Museum is an art museum located in Wichita, Kansas. It was established in 1915, when Louise Murdock’s Will created a trust to start a collection of art works by “American painters, potters, sculptors, and textile weavers. ” The collection includes works by Mary Cassatt, Arthur G. Dove, Thomas Eakins, Robert Henri, Winslow Homer, Edward Hopper, Yasuo Kuniyshoi, John Marin, Horace Pippin, Maurice Prendergast, Albert Pinkham Ryder and Charles Sheeler. The annual Kansas State Fair is held in Hutchinson each September. The 2011 State Fair runs from September 9 through September 18. The Kansas State Fair is held annually beginning the Friday following Labor Day and lasts for 10 days at the Kansas State Fairgrounds in Hutchinson, Kansas. The largest single event in the State, the Fair annually attracts approximately 350,000 people from all 105 Kansas counties and several other states. Botanica, The Wichita Gardens 9.5 acres (3.8 hectares) are botanical gardens and park located at 701 North Amidon, Wichita, Kansas, USA. They are city-owned as part of the Wichita Park System.